Several Blue Corridor rallies across Europe have highlighted benefits of using natural gas fuel. 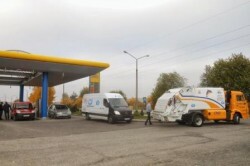 To boost the take-up of alternative fuels in transport, EU countries will have to ensure that enough refuelling and recharging stations are available to enable cars, trucks and ships using alternative fuels, such as natural gas and electricity, to move freely on EU roads and waterways, under an informal agreement reached by Council and Parliament negotiators on Thursday. “This is a crucial step forward for the development of alternative fuels. It represents a balanced agreement which holds together both the ambition and the realistic approach that makes this directive the appropriate tool to create market prospects and give operators and manufacturers certainty as to the law”, said Carlo Fidanza (EPP, IT), the rapporteur and lead negotiator for Parliament. The new EU rules will seek to reduce the EU transport sector’s dependence on oil and curb its climate impact. They will require member states to develop the infrastructure needed for alternative fuels. EU countries will have to draw up plans including targets for the number of recharging and refuelling stations provided so that electric cars and cars using compressed natural gas (CNG) can circulate freely within EU cities. National plans and targets should ensure that electric cars and vehicles running on CNG can move freely in cities and urban areas by the end of 2020; that trucks and other vehicles using liquefied natural gas (LNG) and CNG can move freely along roads in the EU’s TEN-T core network by the end of 2025; and that LNG-powered ships can move between TEN-T network maritime ports by the end of 2025 and between TEN-T network inland waterway ports by the end of 2030. Member countries that opt to include hydrogen-refuelling stations in their national plans will have to ensure that enough of these stations are available to ensure smooth circulation by 2025. The plans should not add any extra costs to member states’ budgets. However, they could include incentives and policy measures such as for example building permits, parking-lot permits and fuel-station concessions. These plans and common standards for recharging and refuelling installations should create stable conditions and investment security needed by the private sector to develop the infrastructure. The informal agreement advances plans formulated early 2013 when the European Commission proposed a Directive to ensure the roll-out of alternative fuels stations across the EU, with common standards to ensure EU wide mobility. The informal agreement still needs to be approved by the Parliament’s Transport Committee and Parliament as a whole in April and then the Council.